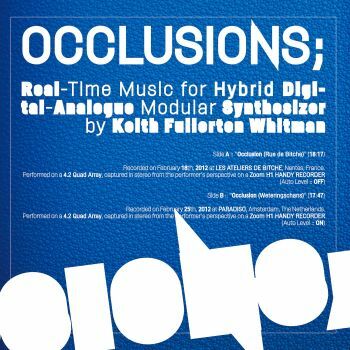 … Occlusion is a loose framework for a multi-channel, freely improvised piece of LIVE ELECTRONIC MUSIC, performed without the aid or consent of pre-recorded or even pre-arranged materials of any kind. A given realization will last between 10 and 30 minutes ; time is elastic. Every effort has been made to avoid divisible rhythms (although mistakes are occasionally made) ... Still, I consider it a \"kind\" of Dance Music.